The lamb appears to be 'on the lamb'. Yesterday we added another 25 cm of snow. The kids were sent home early from school and remain home today. The inside day was put to good use, as I worked away at assembling workshop kits. I will be presenting the Maritime Beauty workshop twice in April: in Tatamagouche, N.S. and near Fredericton, N.B. If anyone in these areas is interested in attending, please email and I'll put you in touch with the registrar. There won't be much sewing time until the kits are done, as they involve making yards and yards of bias binding samples but I did take time to cut and sew one of the borders on the silk quilt. Trying to get a 2 metre length of slippery silk to lie straight to cut is no small chore; this will be a slow process. I'm already dreading mitreing the corners... The colour is such a rich red and really makes the block centres pop. An edge strip of black sets it off nicely from the main section. The match in the print at the seam came out rather nicely as well. Although you can't see it, the lining is a grey-green to match the leaves, and the inside zippered pocket is the floral print. I've decided that a black lining looks smart, but really isn't as it is too hard to find things in the bag. ...and at the same time, Karen worked diligently on her silk Log Cabin quilt, blissfully unaware of the storm raging outside...until she heard the commotion of the birds beneath her window and realized the feeders were empty. The amount of snow down is unbelievable - there must have been 2 feet on the doorstep when I took out the birdseed. No wonder our schools were cancelled today. By mid-morning, 30 blocks were completed and sewn together in 6 rows of 5. I have decided this is large enough, and will work away now on determining how the border should go. March Break passed unbelievably quickly, as it seems to every year. It was nice to have the family all home and do some tripping here and there. Despite all the signs of spring - including the gaggle of Canada Geese which went honking overhead this morning - we awoke to a fresh covering of snow. Our weatherman says it is only a tease for more to come, and we are warned to watch for perhaps 15-20 cm tonight. Today I picked up where I left off a week ago. 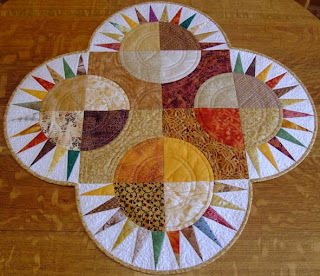 Depending on the final layout (pondering 5 x 6, or 5 x 7) there are either 4 or 9 more blocks to sew before the border goes on. 4 certainly sounds more appealing, as I am well and ready to move on to the next step. I am liking it and looking forward to the actual quilting. The luck of the Irish was with me yesterday on a shopping trip to the big city (Moncton, New Brunswick). This pot of gold landed plumb at the end of my rainbow: Silk dupioni is so luscious...and this was so well priced, I had to buy the whole bolt (a wee leprechaun made me do it...) Silk reflects light like nothing else, and the slubs in the weave add a wonderful texture. It's photographed here on a bit of green to honour St. Patrick's Day. This is a silk log cabin made many, many years ago by my great-grandmother Christina Patterson of Five Islands, N.S. The area schools have begun the annual Spring Break and I will do some handwork so as not to be tied to the machine this week. 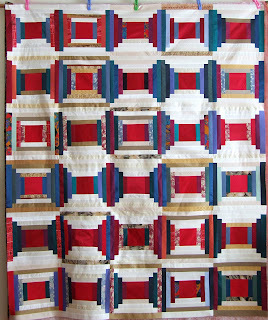 I am using scraps left from the silk log cabin (which is now up to 22 blocks!) to make yo-yo's. Working with silk is very different than cotton which has that nice crisp edge to turn under. Its a bit frustrating to keep a slippery edge in a smooth line as the circle is gathered. Some of the yo-yo's have come out a bit wonky but that will only add character to the finished piece. This will be for a liturgical stole, similar to one I designed awhile back and stitched in bridal satin. In all, I will need 66 yo-yo's. They will be made in shades of blue, purple and red; can you guess what they will be? This leaf is a prototype only - machine stitched; the final ones will be hand embroidered. I love the background piece, a creamy tone-on-tone with embossed leaves just a shade off pure white. A perfect communion piece. and another a few minutes ago. 19 blocks completed out of 35 puts it over half way, so a good time for a break. The pattern is not showing up so well in the photo but will with the proper perspective and a bit of rearranging of blocks. I am hoping to have this finished in time for an exhibit at the Cumberland County Museum this summer. The silk logs are slowly building, 10 blocks are now complete and you can begin to see the Courthouse Steps pattern emerge. This will get set aside for a few days as I get another project ready to send off to McCall's. The stash of cream/tan silk is quickly dwindling so I may have to raid my closet to see if I have any light coloured blouses left. No wonder I never have anything to wear! We were "powerless" again last evening - literally. This makes every night this week that the electricity has gone off in wake of Monday's ice storm. Thankfully, it is restored before morning so our lives can continue in normal routine. Outside is a treat for the senses, with the sun creating prisms of colour where it glistens on the ice, and the trees tinkling like broken glass in the wind. Walking through wind chimes would best describe the sensation. These pictures were taken yesterday, 3 days after the storm. Working with silk is an equally sensual experience and yesterday I started sorting through a bag of silk blouses which I have been collecting for some time. The colours are sorted very simply into colours and light neutrals to give a light/dark shading. As the fabrics are different weights, the flimsy ones are getting an application of a very lightweight fusible interfacing on the back. I am sewing log cabin blocks in a Courthouse Steps style, using traditional red centres. Sewing silk is slow going; by day's end there were 4 blocks completed. At this rate, the quilt should be finished in about two week's of steady sewing. Amherst got hit hard with a major ice storm yesterday and overnight. We lost power around 9, and luckily regained it by 7 this morning. Everything is covered in ice - a total skating rink outside. The trees are heavy with a thick coating of ice. This male downy woodpecker was undisturbed by my presence on the back deck taking pictures. Even though I was only inches away, his only concern appeared to be that I may have been interested in sharing his suet ball. Home sweet home isn't looking too cosy at the moment. The UPS man arrived in the middle of all the ice to pick up the Log Canada quilt - unbelievable! He said most of the town is still without power; we are very grateful to be among the few who are not inconvenienced by this storm. Over the next 2 or 3 days our weather promises snow, freezing rain, ice pellets, rain...then more snow. Optimists see weather such as this as a great opportunity for handwork. I have been working away at getting the Log Canada quilt ready to send to Houston. The label was sewn on yesterday - computer generated with the information printed neatly on treated fabric. The hanging sleeve also had to get switched out as mine was 1/4" narrower than the show specifications. Last night I finished up a pair of socks (for me) which have been on the go since Christmas. Admittedly, I am neither a fast nor a particularly good knitter but I certainly do enjoy both making and wearing fine wool socks. This colour I've had on hand for a couple of years; it's called "Retro Red". No doubt you can tell that my favourite colour combination is red and white. 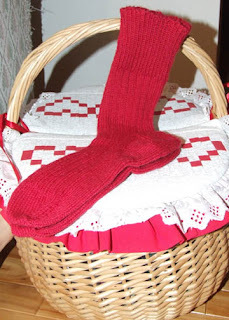 The socks are photographed on a basket whose lid was featured in a column on Seminole patchwork several years back in Quick & Easy Quilting. It makes a great knitting basket.